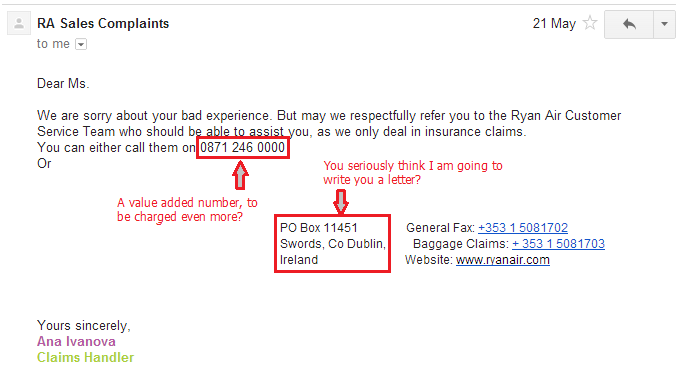 A few weeks ago I had a really bad experience flying with Ryan Air. 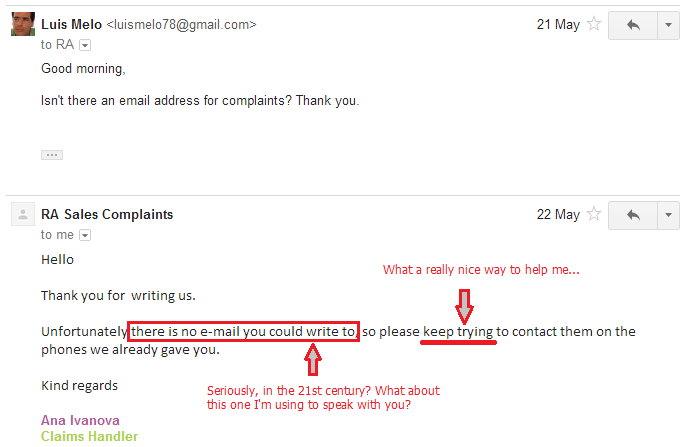 Thus, I wrote a complaint. In Ryan Air’s website they say “We take pride in giving you the best possible service“. It took Ryan Air 10 days (!!) to acknowledge my complaint and in the reply the Customer Service agent asked me to call a value added number or to post a letter to an address. When I asked for a 21st Century channel (e.g. email) the Customer Service agent told me there wasn’t any and also told me (in what I find a rude way) to keep trying to call them. This should be a guide on “What not to do when you want to deliver a good Customer Experience” or “Three main steps on how to lose a frequent Customer“. ClubeFashion is a company that sells major brands products with great discounts. The channel they use is the Web and they have been truly successful. The buying process was simple and prices were good. That gave them a huge amount of clients by referral. Personally I recommended them to 10 or 15 friends. I have been ClubeFashion’s customer for at least 5 years, made many purchases and was extremely happy with them. Even if on Christmas the product’s shipping took more than the average. The overall balance was very positive and I was loyal to the company. Actually I was an advocate as I recommended it to friends. A few days ago I went to clubefashion.com and saw a pair of nice shoes. The price was 74€ but when I went to the checkout the price was 84€. There was 10€ in debit on my account. I knew I didn’t have any amount in debit so I cancelled the purchase and sent a message to ClubeFashion’s Customer Service. They took exactly 72 hours (3 days!) to reply and said they were sorry. It was a system bug that in the meantime was solved and so I was allowed to do the purchase again. The problem is promotions have deadlines, and the shoes I wanted to buy were taken off the site at 23:59 on the day before they replied. So I sent another message to them thanking for the reply but saying that because of the delay on their answer, I was not able to buy the shoes anymore. Honestly I was expecting that they would reply saying that I could have the shoes anyway because it was their fault. But unfortunately I was wrong. ClubeFashion’s customer service replied saying that they tried their best and suggested that I kept looking on their website for other opportunities. What? First, it seams that their best is not enough. Second, I don’t want other opportunities. I wanted those shoes not others! Their reply really annoyed me. With this bad Customer Experience I turned from a loyal and advocate customer to an unresponsive and unsatisfied one. Obviously I am not going to buy from them so frequently and I would definitely not recommend them anymore. Actually it is worst, I am writing this post and sharing it on the social networks. It’s their loss, when all could have been solved if they assumed the error and treated me well. If they gave me the chance to have the shoes, I would be really happy and more loyal and advocate than before. Because, I could then see that they really worried about the customer and “broke the rules” to please me. As they made suggestions I will now make mine. I suggest ClubeFashion keep trying harder on “their best”, rebuild their Customer Service processes, and start focusing on delivering a better Customer Experience. If not, they will lose more and more clients, because they are not the only ones in the market. After publishing this post and shared it in the Social Networks, I exchanged more than 10 messages with ClubeFashion’s Customer Service. At first, the experience was getting worst as they didn’t want to let me make the purchase and they also wanted to held me responsible for losing the promotion. Then after exchanging a few arguments ClubeFashion assumed responsibilities and showed availability to sort this out. They finally accepted the order and I’ll have my shoes. This will turn me from an unsatisfied customer to an unresponsive customer. But remember that 4 days ago I was a loyal and advocate customer. This is the consequence of a bad Customer Experience. Walt Disney once said: “Do what you do so well that they want to see it again and bring their friends“. This explains the link between Customer Experience and Loyalty & Advocacy. As I wrote before, nowadays no company can differentiate only on product innovation or lower price. Differentiation has to be achieved by delivering a better Customer Experience. And actually research shows that 86% of consumers are willing to pay more (up to 25% more!) for a better Customer Experience. Therefore companies have to focus on this new trend. Customer Experience is the sum of all the interactions a customer has with a company during their customer lifecycle, and has become a key strategy on today’s hyper competitive market. A company-customer relationship does not start with purchase and ends with delivery. 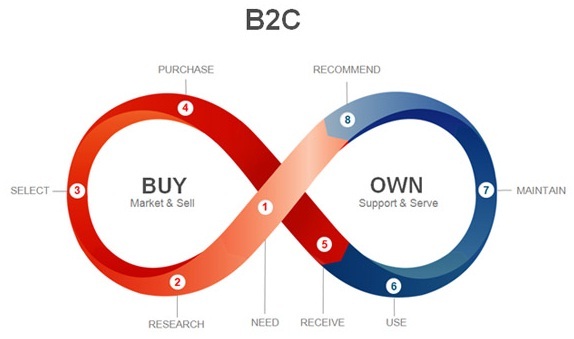 It exists in an infinite loop that’s reinforced as the customer interacts with the company over time. Delivering a good Customer Experience implies that companies have to focus on their customers’ needs, taking into account that today we live in a hyper connected global marketplace. Companies have to deliver consistent and seamless experiences across all channels (store, web, mobile, phone, mail). And they have to do it before, during, and after customers’ purchases. Furthermore companies have to be where their customers are. They must be present on the social networks as well. They have to provide their services on Facebook, Twitter, etc. Being able to provide a better Customer Experience is the only way to succeed in turning an angry or unresponsive customer into a satisfied, loyal or even advocate customer. If a company can succeed on this, it will decrease churn, maximize retention, acquire new customers (by recommendation), and therefore increase profit and growth. O trend de hoje no mundo dos negócios chama-se CX – Customer Experience. Nenhuma empresa poderá sobreviver no futuro próximo sem ter em conta e sem investir nesta estratégia que pretende melhorar a “Experiência” do seu cliente. Hoje, nenhuma empresa consegue diferenciar o seu produto apenas pelo preço ou pela inovação. Os concorrentes conseguem rapidamente criar um produto similar e a luta por preço baixo tira lucro. “Experiência” é o que diferencia. E se ainda há muitas empresas – mesmo algumas grandes – que têm dúvidas e são cépticas em relação à importância do CX – Customer Experience, deixo aqui uma história que demonstra bem a ideia do CX e os seus efeitos. Em 2008 David Carroll e a sua banda (os “Sons of Maxwell”) viajaram na United Airlines desde Chicago para dar um concerto no Nebraska. Ao chegar ao destino David viu que a sua guitarra de 3.500$ tinha sido danificada. Todos sabemos, e muitos testemunhamos (como foi o caso do David Carroll), a maneira como os funcionários das companhias aéreas tratam a bagagem que é transportada no porão dos aviões. Daí o David ter feito uma reclamação. Como é habitual nos dias que correm, na United Airlines o processo de reclamação foi extenso e penoso. Durante 9 meses David Carroll falou com dezenas de pessoas, e todas elas empurravam a responsabilidade para o próximo. Finalmente a resposta definitiva chegou e foi “Não”. A United Airlines não iria assumir responsabilidades e não iria pagar a guitarra. David Carroll aceitou a resposta mas prometeu criar uma música e publicá-la no Youtube. No primeiro dia a música atingiu as 25 mil visualizações e tornou-se viral. Uma das pessoas que viu trabalhava na CNN e levou “o caso” para a televisão. Em pouco tempo o vídeo ultrapassou 12 milhões (!!) de visualizações. Isto fez com que as acções da United Airlines descessem 10% e uma empresa que valia 2 Biliões $ passou (de um momento para o outro) a valer 1.8 Biliões $. Tudo por causa de uma guitarra que valia uns “míseros” 3.500 $. As empresas têm de melhorar a “Experiência” dos seus clientes e não podem desprezar nenhum deles. Doutra forma correm o risco de ser “vítimas” do poder das redes sociais onde o seu cliente “é que mais ordena”.